Well, it's the end of May and the summer is well and truly here. We've had some really beautiful weather over the last week so what better way to enjoy this than to ditch the technology and get the family outside. There is nothing wrong with outdoor equipment and just let the kids play in the sandpit or slide and swings, but I'm talking about having some fun with the children, getting involved and making memories. 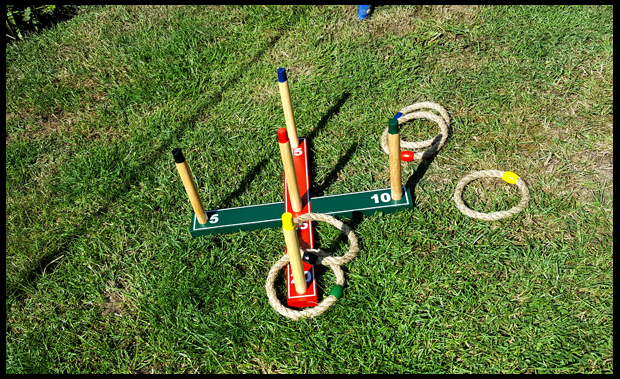 One of our popular games in the garden and one we take on picnics with us is the Quoits game which can be purchased from Wayfair. It's a great traditional game where you need to throw the rings over each of the coloured pegs. The fact the posts are coloured is what adds to the fun for us. I'm pretty rubbish it turns out! We also have a giant chess set which is brill for taking up time in the sun. We are always well prepared if we are playing chess with sun cream, plenty of water and for me plenty of patience. 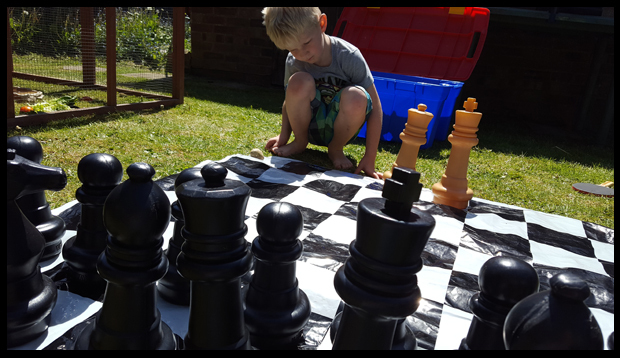 My son is only 5 but loves the idea of the game, so I try and teach him a little each time we play, he knows the pieces names, almost knows where they all go, and knows the moves of a knight perfectly! For those who don't want to just sit, but don't want anything too energetic in the sun either - isn't this one a perfect compromise? Just because you play table tennis indoors, doesn't mean to say it has to stay inside! 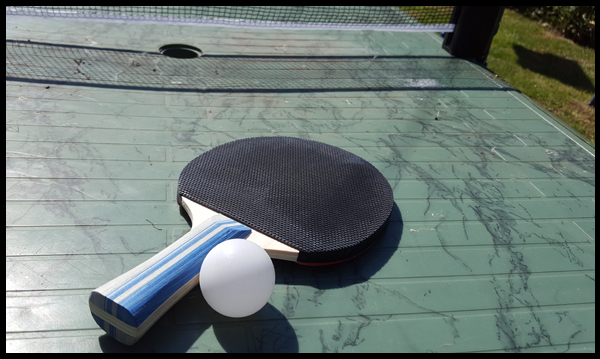 We picked up a great little table tennis set which clips onto an existing table. Yep, we clipped ours onto the old garden table, but do you know what, it doesn't matter. Kids don't care about the finer details, in fact, the ball never hits the table when we're in the garden. It's got more chance of hitting the roof of the shed! Just because it belongs inside shouldn't restrict you, so long as you remember to bring it back in before the end of the day or before the weather turns bad, then it's a cheap way to get the kids outside. These are the best! For those who follow my blog will know we are very much a DIY and upcycling family. I'm terrible for bringing home a random pallet, electrical reel (OK, I haven't got that yet, but I'm working on it!) and tyres. 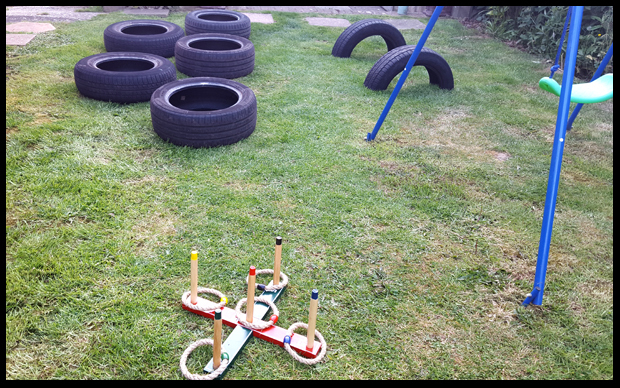 Yep, we have tyres because I'm making a dragon, but when "we" brought these tyres home, my son immediately asked me to place them around the garden, along with his Quoits and table tennis - we all of a sudden had some mad obstacle course. We got the stopwatch out (That's the only technology we were allowed) and timed each other running around the garden going through tyres, throwing, batting, and jumping through a swing! It didn't end well. I may have got stuck on the swing at one point and my feet don't quite fit in those tyres well - meaning I lost! Old slowpoke here took 50 seconds to my son's 35! I do have a video of us playing this, but unfortunately, it's not one to share, apparently it's to be completed in your pants.......... if you're a kid, I don't need to be scaring the neighbours now. Do you have top tips on getting the kids in the garden?